The Greek island of Corfu, the second largest of the Ionian Islands, is located in the northwest of Greece. Well known for its beautiful scenery, Corfu is also called “the green island” and is a popular destination for tourists. The name Corfu, or Kerkyra, traces back to an ancient myth, in which the Greek god Poseidon fell in love with the beautiful nymph Korkyra. Today, the citizens of Corfu and tourists can visit the historic fortress and stroll through the ancient streets. At Spianada Square, they can also experience a serene and peaceful atmosphere when they encounter Falun Dafa, an ancient meditation practice first brought to the public in China. In ancient China, there were many cultivation methods to improve one’s physical condition and attain inner peace. Today, such practices are called qigong, and there exist a wide range of different qigong schools. Among them, Falun Dafa, also known as Falun Gong, is the best known. It has four standing exercises that consist of slow, gentle movements, as well as sitting meditation. Falun Dafa is based on three core principles: Truthfulness, Compassion, and Forbearance. Doing the exercises and living by these principles help practitioners achieve balance and be kind to others in daily life. 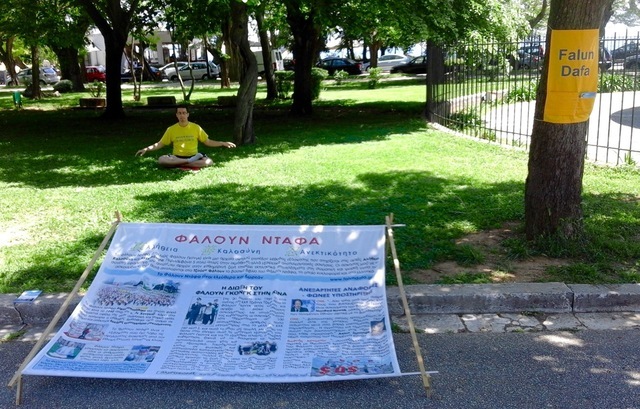 In a park in the city of Corfu, people stopped to watch the Falun Dafa exercises and read the banner telling them about the persecution of the practice in China, which has lasted 17 years and is still ongoing. One man wanted to know why Falun Dafa is being persecuted. A practitioner explained that former Chinese president Jiang Zemin initiated the persecution after learning that there were more practitioners than members of the Chinese Communist Party (CCP). Nearly every part of the life in China is controlled by the Party. People in China grow up in a society permeated with CCP ideology. The three principles of Falun Dafa, and the understanding of looking within oneself for shortcomings when a conflict arises, no longer exist in other qigong practices. The practitioner explained that Falun Dafa is like a revival of Chinese tradition. A young lady from the United Kingdom, who had already heard about the persecution of Falun Dafa, walked directly over to the practitioner and asked for more information about the Chinese regime's killing of imprisoned Dafa practitioners for their organs. The practitioners explained that the Chinese authorities forcibly take and sell the organs of practitioners in order to eradicate Falun Dafa while making a profit. People of all ages were moved upon hearing about the brutal persecution in China and asked how they could help. 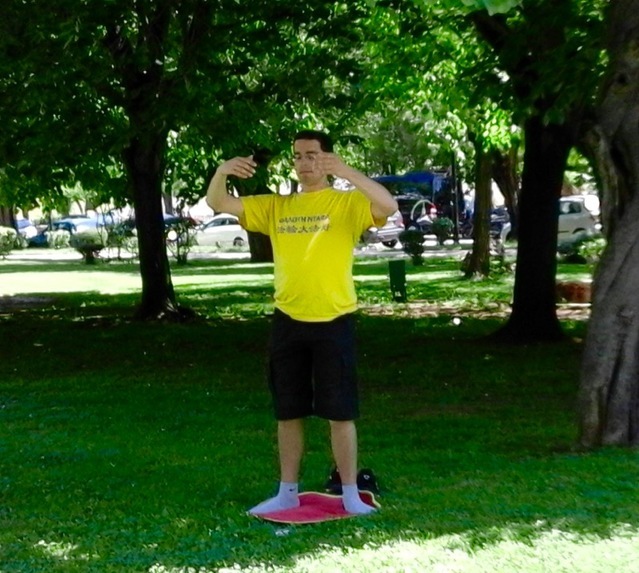 When people asked about learning the Dafa exercises, the practitioner told them about the free instruction every Sunday morning at 10:00 a.m. near the Maitland Monument on Spianada Square.